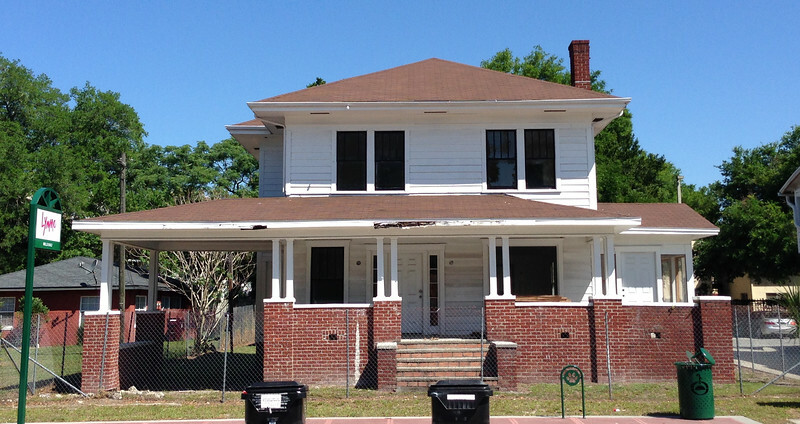 The Case of Parramore, an African American community in Orlando that has been almost erased from history. When driving around a city it is easy to overlook the erosion of the historical factors that have shaped a neighborhood. Such is the case when considering the trajectory of urban development in the postwar racially segregated American South. The historical timeline of Florida’s modern development contains objectionable incidents of violence, disenfranchisement and disparity among social classes. The hidden story of the intersection between racial oppression and urbanization became clear to me as I explored the social, cultural and economic decline of the African American community of Parramore in Orlando, Florida. In order to do that, I have analyzed the differences and similarities between theimpact of racial segregation and uneven economic developmentpresented in the United States as a whole and in Parramore, mapping out the main reasons that forced the African American community to decay: the formation of black settlements after Reconstruction, disenfranchisement and racial violence against black Americans, and the disruption of inner cities through the construction of public housing and interstate highways. After the end of Reconstruction in 1877, the racist customs left over from America’s legacy of slavery reappeared in the form of “codes” that regulated the settlement and commuting of African Americans. As the industrialization of the country developed throughout the 20th century, the history of racial segregation in America paralleled the history of the rise and the decline of the inner cities. Historians C. Woodward and William McFeely write that, with the black codes, African Americans became disfranchised throughout the South and that “Neither equality nor aspirations for equality in any department of life were for them.” Hence, as Reconstruction ended, racist politicians succeeded in promoting racially discriminatory policies. In Florida’s Orange County, as in other Southern communities, the first African American settlements appeared through the influence of white employers who provided housing for black domestic help and grove workers. In 1870, businessman and diplomat Henry Sanford opened Georgetown for his black citrus pickers. 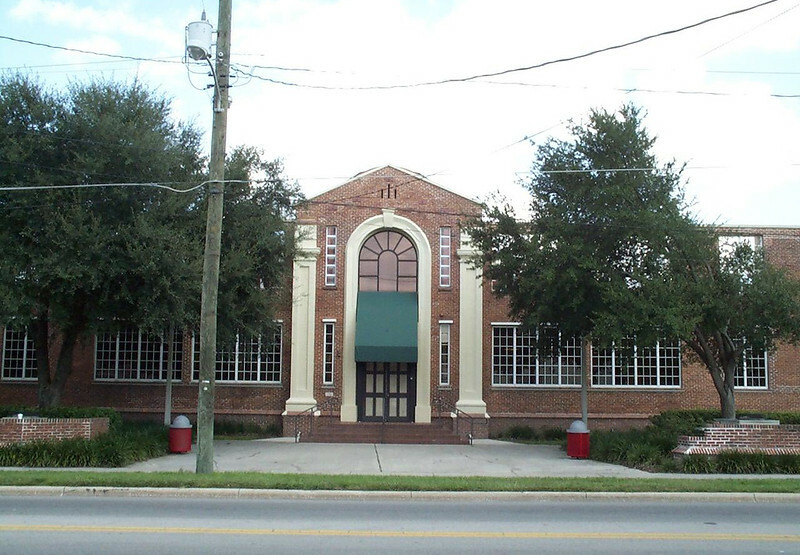 Fifteen years later, Winter Park developers plotted and laid out the community of Hannibal Square for their black employees. In Orlando, James Magruder, a white homebuilder, subdivided into lots the location of the first African American community, Jonestown, in the southeast section of downtown. Although Jonestown emerged as the first, Parramore became the largest black community in Orlando. Following the same pattern of development, Parramore appeared after James B. Parramore, a white confederate soldier and ex-Orlando mayor plotted the area for the community in 1881. Parramore emerged from the relationship between the two races in which whites decided where African Americans could live and work. Similar to rest of the South, Florida developed an aggressive pattern of racial violence and disenfranchisement. Historian Irvin Winsboro writes that between 1880 and 1930 white mobs lynched 3,220 blacks in the South. At odds with the common perception that Florida has always been a moderate region in the South, during these 50 years the Sunshine state maintained one of the highest per capita rates of extralegal deaths. Central Florida suffered the same fate as racial violence spread throughout the country during the First Great Migration when whites began physically threatening blacks when they attempted to legally vote. In 1920, after African Americans tried to vote in Ocoee, whites destroyed the entire black section of the city. The mob moved to other counties of the region killing around 50 African Americans and burning all of their properties. Three years after the Ocoee Massacre, white violence against blacks destroyed the entire small town of Rosewood, Florida. The white mob burned black churches and black houses and tortured, mutilated and killed six black Americans. The Ku Klux Klan’s revival in the 1920s intensified white brutality. Newspapers across the state reported that the Klan recruited young people and organized public parades in small towns across the state. Beyond brutal violence, the 1885 Florida Constitution also hampered blacks from voting by creating barriers such as multiple ballot boxes, requiring literacy tests and poll taxes. In Orlando, the White Voters Executive Committee of the Democratic Party controlled primary elections and denied voting rights to blacks until 1950. Hence, white brutal violence and institutionalized acts converged into making African-Americans completely disenfranchised. For much of the twentieth century Orlando’s black society strove to establish itself as a thriving community. By 1940, Parramore enjoyed relatively good economic development with some successful professionals and establishments. 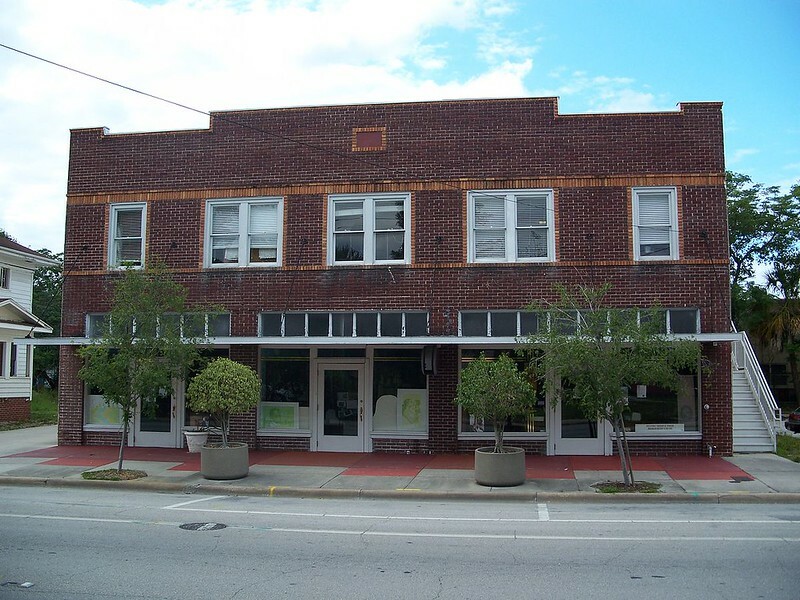 The leadership of African Americans such as Sylvester Hankins Jr. and Dr. William Wells demonstrated how individuals helped foster Parramore’s development. Hankins Jr. was a physician born in Parramore in 1895. He attended Johnson Academy through the eighth grade and helped organize the Orange County Branch of the NAACP. Throughout his life, Hankins Jr. prospered as a member of the Mental Health Board of Orange County. In addition to his job, as an anti-segregation activist Hankins Jr. constantly provided free healthcare and tuition donations to low-income African Americans. 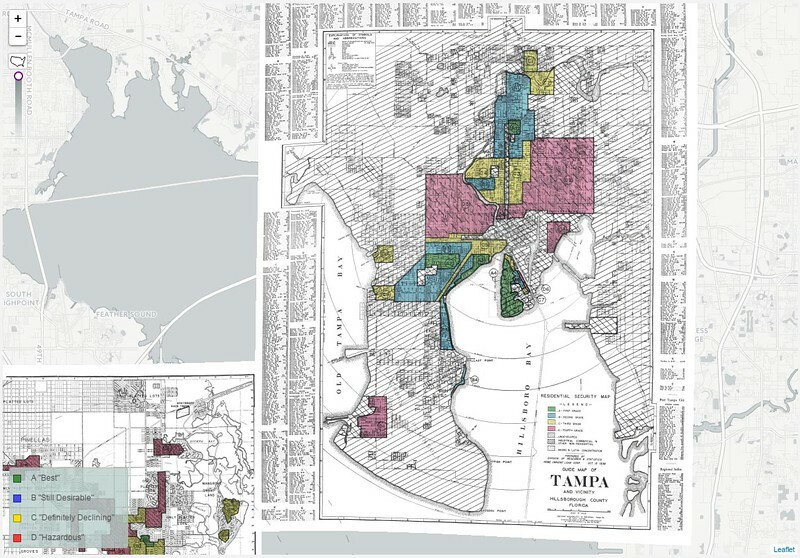 A ‘security map’ of Tampa, FL produced by the Home Owner’s Loan Corporation that sought to steer mortgages away from inner-city neighborhoods between 1935 and 1940. This practice led to lenders redlining urban neighborhoods into virtual ruins. Image Credit: University of Richmond. Another example was Dr. William Monroe Wells, who emerged as a successful black physician in Orlando after his arrival in 1917. A contemporary to Hankins Jr., Wells provided free healthcare for low-income black Orlandoans with the assistance of Mrs. Josie Belle Jackson. Besides his daily job, Dr. Wells had an important role fostering local culture and providing entertainment. 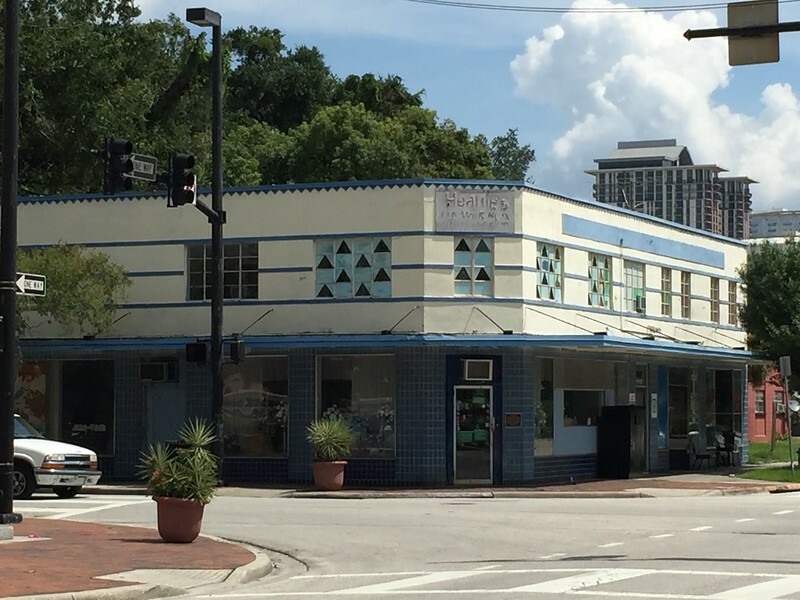 In the 1920s, Wells built a hotel and a nightclub in Parramore. Performers such as Ella Fitzgerald, Cab Calloway, and Count Basie played at the venue and later spent the night at the Wells’ Hotel. The South Street Casino provided entertainment for black Orlandoans to dance and play. , Dr. Tim Lucas Adams, affirms that his parents used to attend parties and his father had the opportunity to play trumpet at the venue. Dr. Wells and his establishments’ success represented thriving moments for the community. Just like several others African-American neighborhoods, Parramore suffered bold urban transformations after 1940. As the first Great Migration led African Americans to depart for the North and West, the South experienced a wave of revitalization through federal funding that led to super charged urban development. Postwar growth unequally affected suburbs and inner cities in which governments and private corporations nurtured urban development in ways that maintained racial segregation and social inequality. On one side, business and political leaders focused on developing suburbs. They favored building the interstate highway system, single-family housing, and suburban employment, with an emphasis on the car as the main means of transportation. White, middle-class families enjoyed by far the greatest opportunity to take advantage of these policies, moving to suburbs with the government funding of agencies that favored whites over minorities in access to home loans and other benefits. Meanwhile, as the private sector developed the suburbs, the public sector turned toward transforming inner cities with projects of “urban renewal.” These programs included “slum clearance” projects that demolished existing black communities, while concentrating African Americans in public housing projects that reproduced racial segregation, social inequality, and deficient infrastructure. Another profound change cut black inner cities in the middle with the construction of the National Highway System, as interstate construction caused displacement of hundreds of thousands residents all over the country.